VEGAS Movie Studio Platinum offers our most user-friendly approach ever to creating beautiful videos. Work fast with interactive storyboards. Work confidently with automatic saves. Work smoothly with GPU and hardware acceleration. 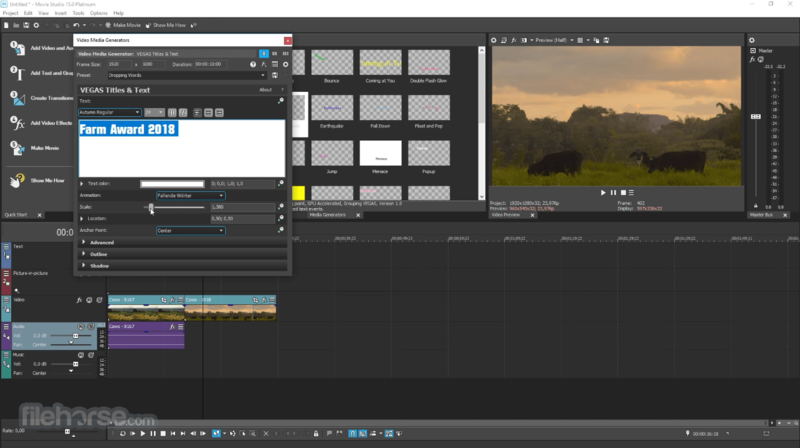 Powerful and intuitive – nothing helps you create like VEGAS Movie Studio 16! 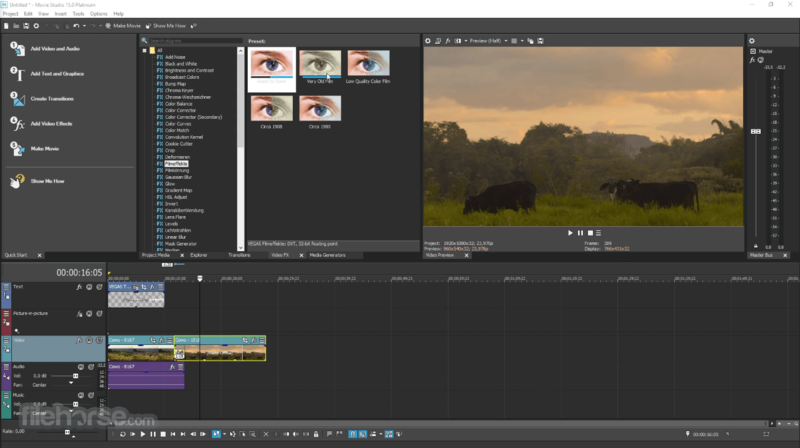 Find the right video editing software for you. Easy click-and-drag workflow, dozens of audio and video effects, sophisticated titles and text, free Music Maker software, and more. Explore all three versions and find the perfect movie editor for your storytelling. Movie Studio adds even more exciting tools to the robust feature set with world-class video stabilization, a complete 360° editing workflow, motion tracking, and much more. 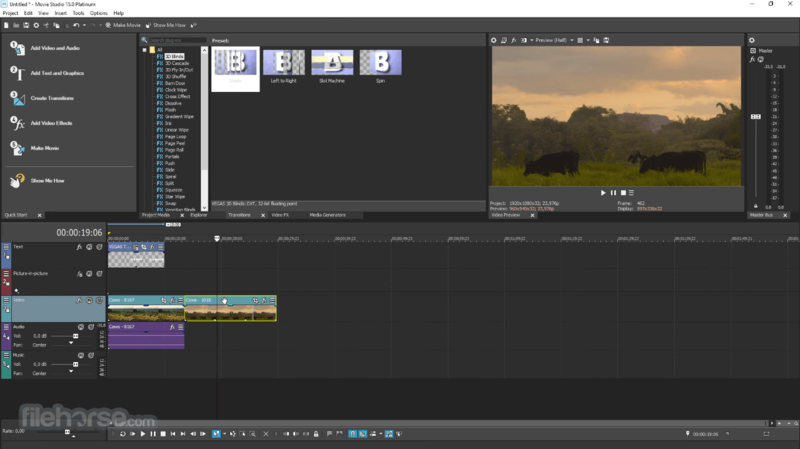 Discover the innovations and edit like a pro with VEGAS Movie Studio Platinum! Complete your movie editing kit with the Suite. Create beautiful videos with text tools, transitions, and tons of effects from industry leader NewBlueFX. Fuel your creativity with the full feature set of VEGAS Movie Studio 16 Platinum. Innovative, feature-packed, and complete. Get the most with this Suite! Instantly match colors between two clips so you don't have to worry about off-color video. Use the Color Match plug-in to make two different scenes appear as though they were shot on the same day, at the same time, and with the same filter. Reduce jitter and shaky video footage with image stabilization technology. Shaky video footage, shot from handheld camcorders and smart phones, can be quickly salvaged. Create dynamic slideshows from a set of images with a few simple clicks. Create pan/zoom effects and transitions across an assortment of still images. Audio Event effects provide more precise control over the placement of audio effects as you can apply unique effects directly to events. Record your own voiceover and music into Movie Studio. Work with up to 20 tracks, all of which can be used to record audio. You can also record different takes and use one or all of them in your project. Make sure your movie looks its best when you share it with others. 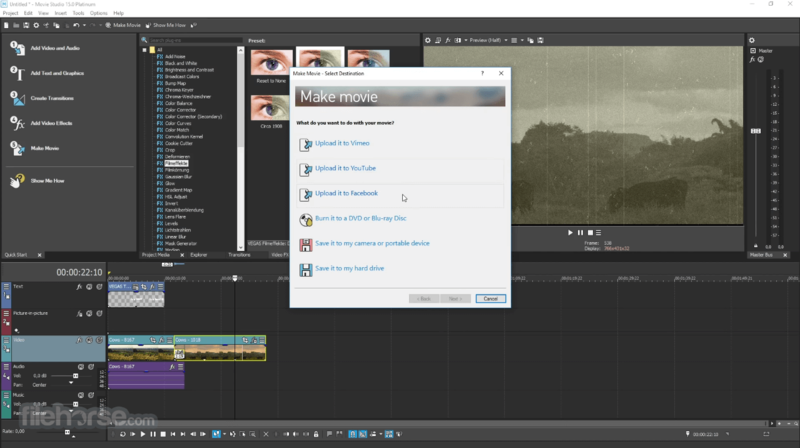 The updated "Make movie" dialog makes it easy to select the best format for the desired destination. When you're finished making your movie, upload it directly to YouTube or Facebook from the Movie Studio application! Sharing your creativity has never been this easy. DVD Architect Studio software supports popular video and audio formats so you can make DVD and Blu-ray Disc™ projects that will play on almost any DVD/BD player or DVD/BD-capable computer. Watch your project on a simulated television monitor with a virtual remote control. Use the buttons on the remote control to navigate and play your movie. Burn a DVD or Blu-ray Disc directly from the Movie Studio Platinum timeline. This method is fast and makes it incredibly easy to create a single-movie DVD or Blu-ray Disc that you can easily share with family and friends.